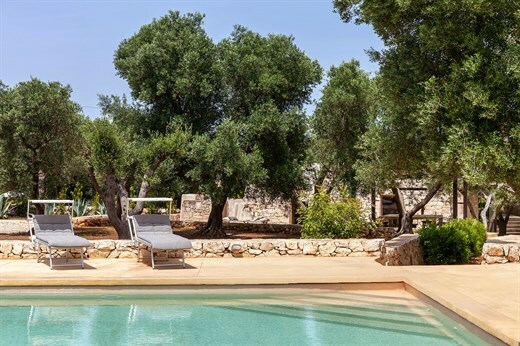 A stylish, elegant "trilla" hideaway in the olive groves of Ostuni! Secondo Amore is Puglia's answer to a woodland hideaway, except the woodland here is an olive grove, and the property is no log cabin, but a trilla (TM! ): a super-chic, architect-designed trullo renovation with a villary twist! Relaxation is unavoidable and peace and quiet is on tap but for the more active there is plenty to do and see on the doorstep of this little Puglian piece of paradise. ¹ why not organise for a "pizzaiolo" to come and make your pizzas for you? Inside: accommodation at Secondo Amore is all on one floor and is organised extremely simply. To one end of the house is the original trullo section, home to two cosy interconnected living rooms, one with an alcove with day bed (perfect for supine pursuits) and one with comfortable sofas, a fireplace and TV. Both have glass doors accessing the outdoor areas and the latter leads through to the delightfully stylish kitchen-diner with its wall-length glass sliding doors accessing the outdoor dining area and gardens. A cleverly positioned skylight allows the Puglian sun to flood in, adding to the airy, bright feeling. A small corridor and a couple of steps lead from the indoor dining area to the main sleeping quarters, comprising a master double with en-suite shower room and a further two bedrooms (a double and a double-twin) sharing a shower room. All bedrooms have French windows accessing the gardens. The accommodation is completed by a fourth bedroom (with en-suite shower room) in the dependence just a few steps away across the courtyard from the main house. Secondo Amore has been designed to calm and charm. Stylish modern furnishings sit easily on the simple stone and wood background, and original wrought-iron artworks complement the angular simplicity and clutter-free nature of the design, resulting in an extremely attractive contemporary home. An excellent option for those wishing to unwind after a stressful year's work. Secondo Amore is situated at the southern end of the Valle d'Itria between Ostuni, a beautifully restored baroque town with stunning panoramic views, and the pretty centre of Ceglie Messapica. The Valle d'Itria, however, is probably best known for its trulli, and nowhere are these more in evidence than in the picture-postcard town of Alberobello. Locorotondo, Cisternino and Martina Franca are also well worth a visit. If you are looking for beaches, the Adriatic coast offers endless stretches of sand and some well recommended lidos from which to enjoy it. Further afield, Lecce, Gallipoli, Otranto and Monopoli are justly famous towns waiting for you to unlock their secrets. "We loved Secondo Amore. Everything was in excellent condition, the photos were consistent with the actual villa, and the grounds were well maintained. We LOVED the pizza maker. It was a top highlight for us. One of our best nights."